When you were a kid, you probably played with action figures, or something like them. They were awesome. You also played video games, which were similarly awesome. Now they're being brought together in a way that against all odds, isn't horrible and schticky. It actually makes a load of sense. Yesterday, Hasbro took two deeply annoying things (Angry Birds and QR codes) and mushed them together into something surprisingly nifty. It's putting mini QR codes on the bottom of the physical Star Wars Angry Birds toys it's selling. When you line up the toys with your phone or tablet's camera, you unlock special characters in an Angry Birds game. It's simple, it's fun (sort of) and it feels like you're getting away with something. Namely, with using a super-unlockable character to brutally murder your pig enemies and their families, dragging them, ruthlessly, to a gruesome bird-run slaughter house, where they are disemboweled. Which is nice. According to Hasbro, kids who've used it most like that it feels like you're using the toys you're playing with in real life in the games themselves. The game even keeps stats for individual characters you use over and over again. But where it gets exciting is when you look beyond this specific use case, to all of the other things this sort of physical-digital combo can achieve. Hasbro's strategy is unique in that isn't trying to bridge two things we're supposed to have bridged—like the digital version of a Blu-ray disc—but things that can both totally exist on their own and make a ton of sense in tandem. It's not bare minimum; it's added value on both ends. And unlike Amazon trying something similar last year, the door swings from toy to app, not app to toy, which should make a lot of sense to anyone who's ever just eaten the value of a mail-in rebate because it's too much (read: any) hassle. Still, we're talking about Angry Effing Birds. Angry Birds toys and Angry Birds games on phones and tablets and iPods. But look a little beyond that. 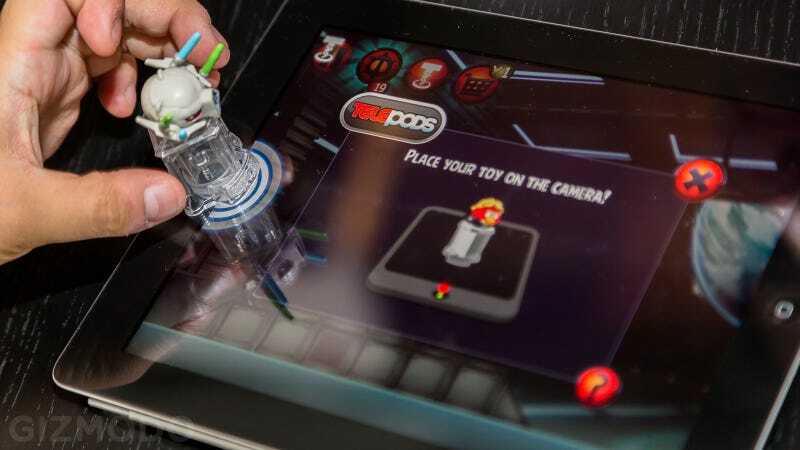 Hasbro's making Telepods for other properties (it owns Star Wars, Marvel, etc. ), which is a start, but it shouldn't limit itself to mobile. This stuff can work for consoles too, and beyond. Actually, scratch that. It wouldn't just work for consoles, it would actively fix some major headaches on those platforms. For the first time, sensors that can detect codes like this are standard on consoles, or at least easily accessible. Every Xbox One comes with a Kinect, which can read a QR code or any other code off of a phyiscal toy. The PS Eye doesn't have the same level of fidelity of the Kinect, but it could easily handle a task this simple. In the past, this would have had to be done by entering some long serial with the controller or the keyboard accessories that no one had. The scanning, though, brings in short-term use capabilities. Like say, if you're activating a character in a fighting game, maybe it's unlocked for a number of fights every time you scan it, or until you sign off, or sure just forever, one-time-use. But here's where this really gets interesting: You could start to get rid of the very dumb exclusive retailer versions of games. Everyone hates when a game like Marvel Ultimate Alliance or a Street Fighter comes out and certain characters (or even cool unlockables) are only available at certain stores. It's impossible to get everything in one game. Well, if Target could get just the Black Panther action figure exclusive with unlockable character, and Walmart got the Scarlet Witch, and so on and so on, that goes at least some way to fixing this, yes? You don't have to buy different games, just different (much cheaper) action figures. It gives everyone options for making the state of things less terrible. This, really, is the kind of thing that can make games—or anything—feel better. Not revolutionized, or deeply innovated, really, just better in that pleasant way that makes you stop and say Oh, that's really convenient. Which, most of the time, is really the best way. And increasingly hard to come by. That's the main thrust here, taking two things that are complete on their own, and tying them together in a way that makes life easier. For someone who really likes Angry Birds, this is transformative in a way that other toy-to-game stuff isn't, And sure, the economics would need to be squared away in some back room by people who own calculators, but I'd love if I could jump online and buy a few exclusive figures (or, hell, toy sets) to get the DLC/characters that goes to each retailer.